ikan’s Tri-fly is a must have for any BlackMagic Cinema Camera users who is roaming free from the tripod. Engineered with purpose, its base plate has perfectly placed exhaust holes to allow air flow and prevent the camera from overheating. 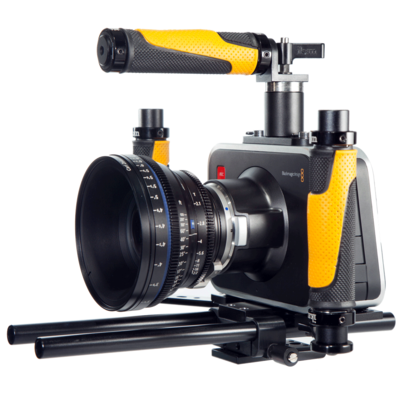 Get low angle tracking shots like never before with a fully rotating top handle. Easily mount your accessories to the ¼” mounting holes on the grips. Power your camera with optional DV or Pro battery solutions using the included 15 mm rods.